Last week, we looked at how to optimize your inventory by organizing your products with an alphanumeric Stock Keeping Unit (SKU) system. Now that you have your SKU system all set up, you’ll know the popularity of your products right down to the individual variants. Knowing this helps you to make informed predictions about what’s worth investing in and how to adjust your order quantities to best suit customer demand. To help you decide on your optimal order quantity, I’d like to introduce the Economic Order Quantity (EOQ) formula. The EOQ formula provides a useful gauge when you’re deciding on the ideal order quantity that minimizes inventory costs while matching customer demand. If your business is up and running, it’s just a matter of looking through your past records to figure out last year’s demand and your costs. However, if you’re still in the planning stages, you can run on estimates drawn from supplier quotes and researching your competitors. The EOQ tells you how much to order, but not when it’s time to reorder, and that’s why you need to know your reorder point. It’s a reminder for you to replenish your inventory to ensure you maintain optimal inventory levels. 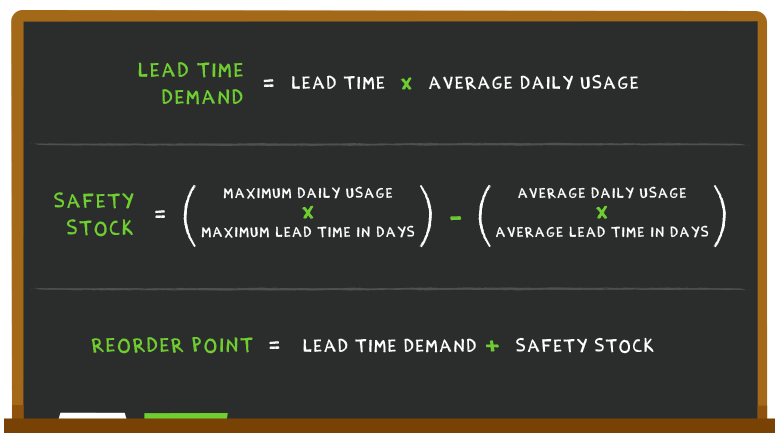 When calculating your reorder point, you need to know your lead time demand and safety stock level. Lead time demand covers how long you’ll need to wait for new stock, because you want to have enough stock to keep your customers satisfied until the new shipment comes in. Safety stock is the buffer stock you carry to protect your business against unpredictable events that can deplete your stock, either due to a surge in demand or the supply chain breaking down. Setting your reorder points lets you cut down on excess spending while providing you with a buffer when things take an unexpected turn. But remembering to place a fresh order every time inventory levels hit the reorder point can be a challenge. If you’re worried about missing the reorder point, it may be time to look into getting inventory management software for your business. It tracks your inventory movement across all channels, and once your stock levels hit the reorder point, it’ll prompt you to place a new purchase order. In spite of your best efforts to calculate the optimal quantity of inventory to have on hand at any given time, you may find yourself stuck with stock that just aren’t selling well. We’ll be back next week to tell you all about dead stock and how you can get rid of it.